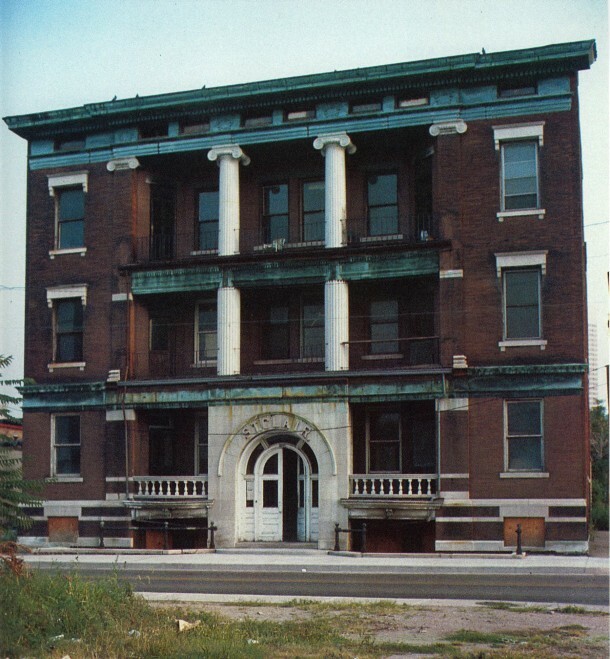 The St. Clair, built at 107-109 West St. Clair Street in 1899, is a true example of a flat saved then lost. 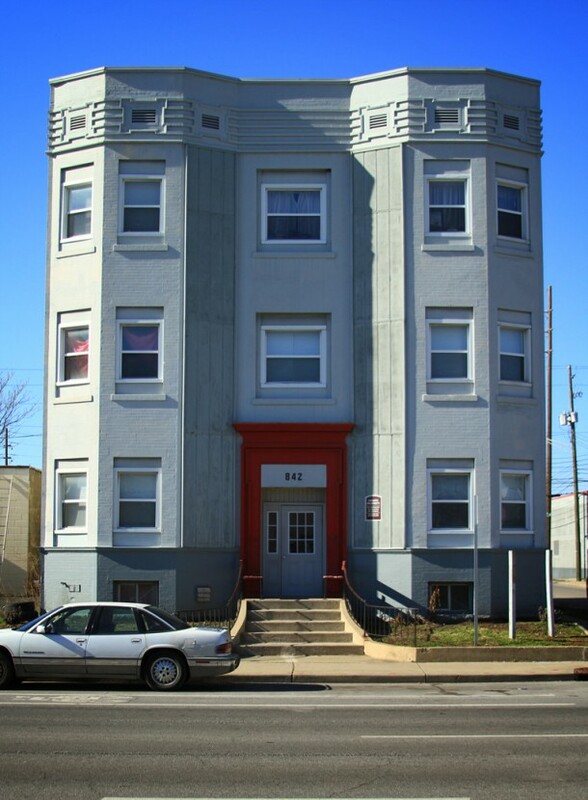 According to the National Register of Historic Places nomination form for apartments and flats, John James Cooper of 740 North Meridian Street purchased the undeveloped plat in 1897; he constructed the flat for $12,000 two years later. Cooper (1830-1906) moved to Indianapolis in 1868 and ran unsuccessfully for Marion County sheriff eight years later; he was however state treasurer in 1882 and 1884 (NRHP Nomination Form, 1983). He was also the owner of the Indianapolis Sentinel in the early 1880’s, which reported on his death that he had “encouraged, planned, and invested in Indiana interurban lines.” (NRHP Nomination Form, 1983) Additionally, he was the president of the U.S. Encaustic Tile Company from 1886 until his death. The building was named after General Arthur St. Clair (1736-1818), a Revolutionary War solider and the first governor of the northwest territories (NRHP Nomination Form, 1983). Flats went for $40 a month in 1913 by then owners Fieber & Reilly. In 1914, the majority of the block contained single-family homes. By 1950, many of these homes still remained, but they had been converted into duplexes. 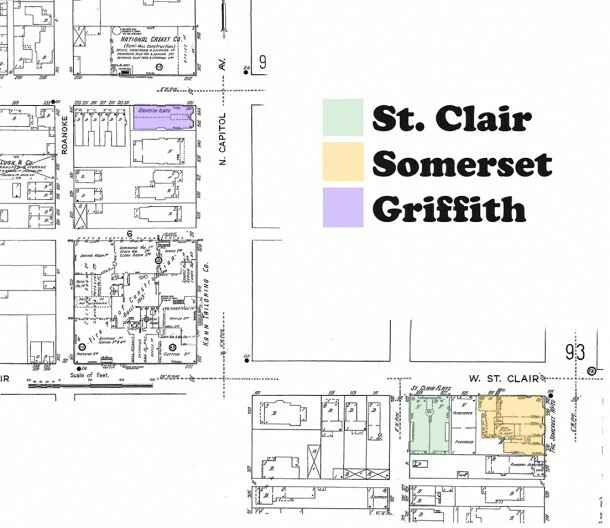 The St. Clair was a brick and limestone H-shaped, three-story plus basement structure with five bays and twelve-foot ceilings. This Eastern-style flat was symmetrical and in a Classical Revival style. 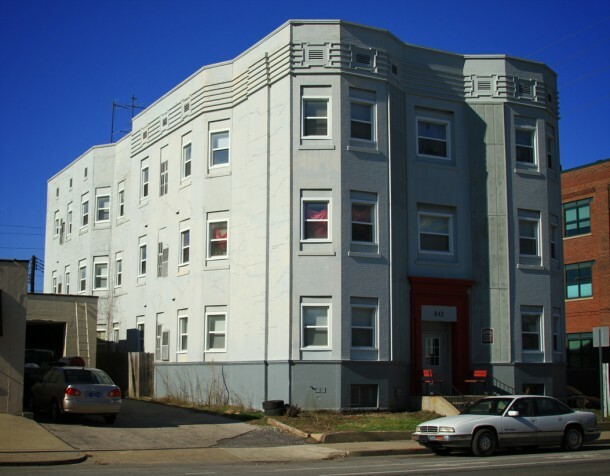 According to the NRHP nomination form on the structure, it contained “larger rooms more formally arranged and a sizeable kitchen” and was an “excellent example of early 20th century flats.” It contained two flats of five to seven rooms per floor. The unique façade design included a seven feet wide semi-circular limestone entrance, very narrow bricks, and two large Ionic columns that went through all three floors to support the metal classical entablature (NRHP nomination form, 1983). The most distinctive feature was the recessed inner three bays, which created small balconies; this recess was enclosed by Ionic pilasters. Also of note are the metal string courses – one three-bay course between the second and third floor and one going through the entire façade between the first and second floor. The other three sides were constructed of common red brick, and the south façade had a staircase tower and oculus windows (NRHP nomination form, 1983). 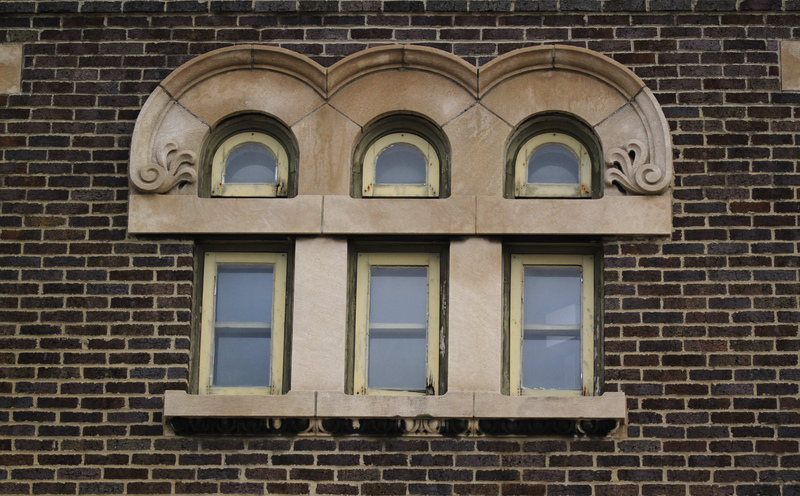 There was a hint of Renaissance Revival elements in regards to the window sills supported by corbels. Scott Keller was well known in Indianapolis for restoring and renting out historic properties downtown. 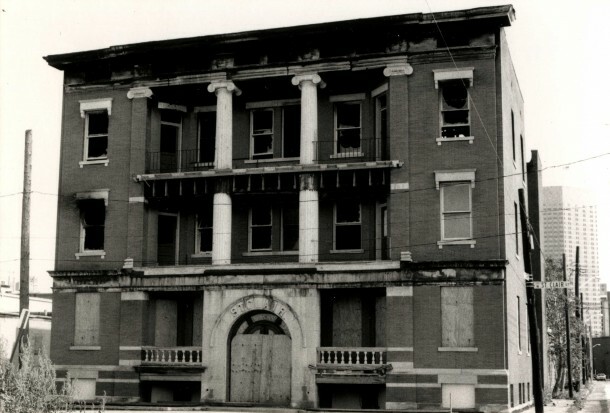 He had preserved fourteen apartment buildings and two mansions; some of which cost $5,600 to $30,000 per apartment to restore (Steve Hall, “Keller: Rebirthing Old Buildings,” Indianapolis News.) Keller’s interest in historic homes stemmed from high school field trips to art galleries in run-down homes in the Herron-Morton Place and Old Northside areas. His intent was to rent units in the St. Clair for between $170-$330. Unfortunately, on January 7th, 1991, the building caught on fire. The Indianapolis Star reported that it took fifty firefighters an hour to put out the fire that Sunday afternoon. At the time, the St. Clair was vacant, but the IFD Fire Prevention Chief Tim Whitaker told reporters that the fire could have been started by vagrants trying to keep warm. On the corner of the same block of the St. Clair Flats was the Somerset, at 730-740 North Illinois Street. 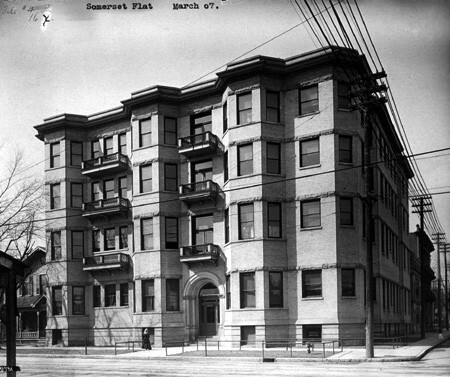 From 1905 to 1920 it was called the Somerset Flats; in 1920 the name changed to Drexel Arms Apartments. By 1930, this four-story plus basement building had been razed. This Renaissance Revival structure had irregular shaped units and twelve-foot ceilings. Renaissance Revival style is characterized by a symmetrical composition, accented rusticated quoins, architrave frame windows, and doors supporting entablatures or pediments. 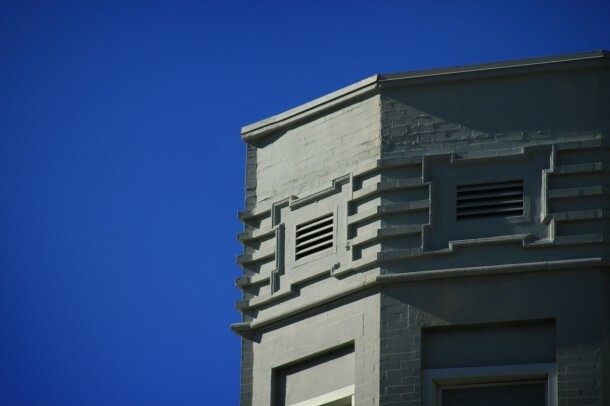 Of note on this structure are the belt course and the architrave cornice. In February of 1910, the flats were sold from Charles G. Ross to William S. Potter for $75,000. 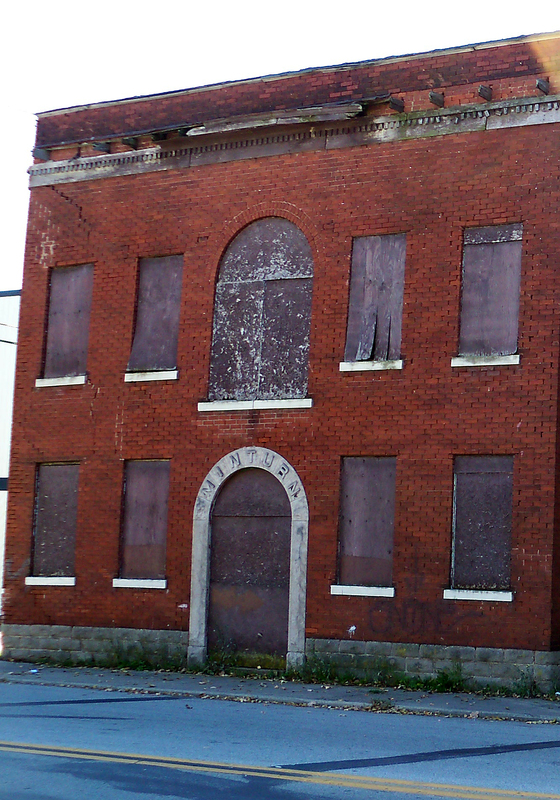 By June of 1910, the Indianapolis Star reported in the article “Lafayette Bankers Buy Indianapolis Property,” that Albert Goslee, president of the Indianapolis Life Insurance Company, and William S. Potter, bought two buildings on the northwest corner of 16th Street and North Delaware Street from William B. Cooley. Cooley, of 1602 North Delaware Street, received $50,000 and possession of the Somerset Flats. Goslee and Potter bought the properties in the interest of City National Bank of Lafayette. Cooley intended on making extensive improvements to the Somerset Flats. The next year, lightning struck the building according to the report, “Flee in Confusion When Lightning Jolts Flat.” No damage was stated in this early report. Mostly single-family homes existed on the block in 1914; across North Illinois Street were the Jessup & Antrim Ice Cream Factory and the Knights of Columbus headquarters. Bad luck struck the flats again in 1920 – a fire started in the basement and filled the upper part of the building with smoke. Again, early reports stated no damage, but within ten years the building had been demolished and a gas station was in its place. The Griffith Flats, built in 1903 at 840-844 North Capitol Avenue, still remain albeit with major alterations. The H-shaped, three-story plus basement apartments are in an Eastern-style flat arrangement and contain twelve-foot ceilings. Remnants of the Renaissance Revival style remain, particularly if one looks at the painted brick elements near the top. However, boarded up windows, downsized window openings, a painted pediment, and the removed cornice leave little exterior charm. 1912 advertisements boasted how fabulous the Griffith Flats were, which at the time contained seven rooms to a flat with bath, steam heat, water, range, refrigerator, and storage. In 1914, the area was mostly populated with duplexes. 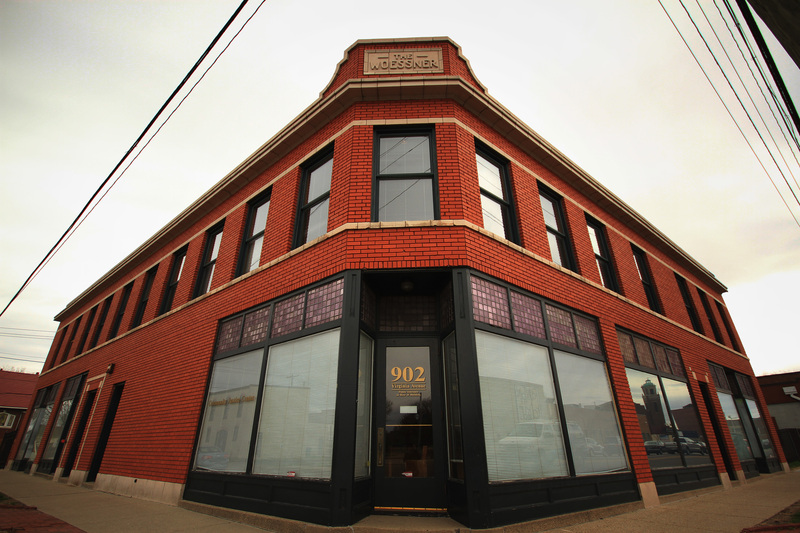 The National Casket Company was across the alley from the Griffith, and a whole quarter block nearby was the Kahn Tailoring Company, built in 1913. By 1950, the National Casket Company remained but the apartments were switching hands, given a blank label on that years Sanborn map. From 1949-1970, the Griffith was called the Delbert Hotel and the Delbert Apartments. In the last few years it was renamed the Towneclub Apartments, an equal housing participant. There were seventeen units then, two studios, thirteen one-bedrooms, and two two-bedrooms. Currently, the Griffith Flats are under renovation by the Whitsett Group, who purchased the building last year. Based in Indianapolis, they specialize in affordable housing and senior developments. 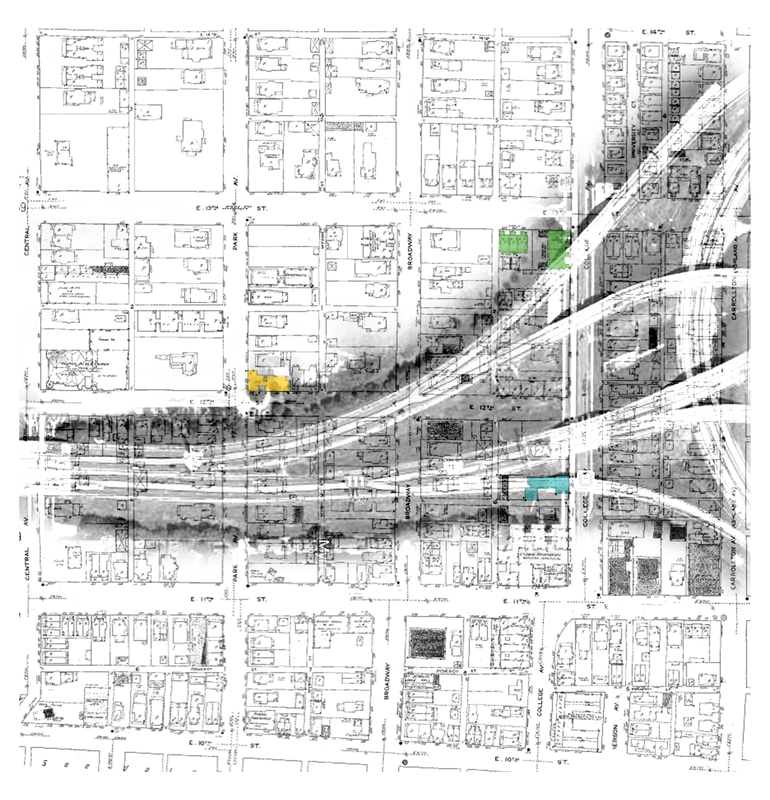 The Whitsett Group is also working on properties at 1010 North Central Avenue (Central Warehouse Restaurant & Supply), the demolished Keystone Towers and Winona Hospital, and three buildings at the northwest corner of Michigan Street and College Avenue. That space is intended to be 190 affordable apartments and 44,000 square feet of retail in three mid-rise structures. They also purchased a foreclosed building at 707 East North Street, which was finished into forty affordable apartments plus their offices. Will stay with this one! The St. Clair was one of the best of the apartments & flats properties. It’s a shame it was lost. I agree, Paul. I wish I could have seen the interiors!